• Promotes healthy digestive function. • Enhances intestinal and gastrointestinal mucosa health*. • Supports a flourishing micro-biome in the gut. • Helps alleviate intermittent heartburn, indigestion, gas, nausea, and bloating*. More and more Western medical doctors recognize the link between gut health and brain health. In fact, the stomach is often called a second brain: What we eat and how we digest it can impact our mood, energy levels, libido, productivity, creativity, and overall immune function. Digestion impacts us on a cellular level. Broken-down food is absorbed into the bloodstream, and its nutrients are carried to each cell in the body. When our digestive fire is diminished—due to stress, diet, hormones, stagnation, or other factors—our cell health is compromised, and our mental health is at risk. A robust micro-biome in the gut is vital to overall good health. Constipation, irregularity, bloating, gas, nausea, and heartburn are all symptoms of an out-of-balance digestive system. All of these warning signs are uncomfortable and energy-zapping: When food isn’t able to leave our bodies properly, we may feel sluggish, irritable, or out-of-sorts. These problems can be addressed with the help of digestive enzymes, natural herbs, and a healthy system overall. 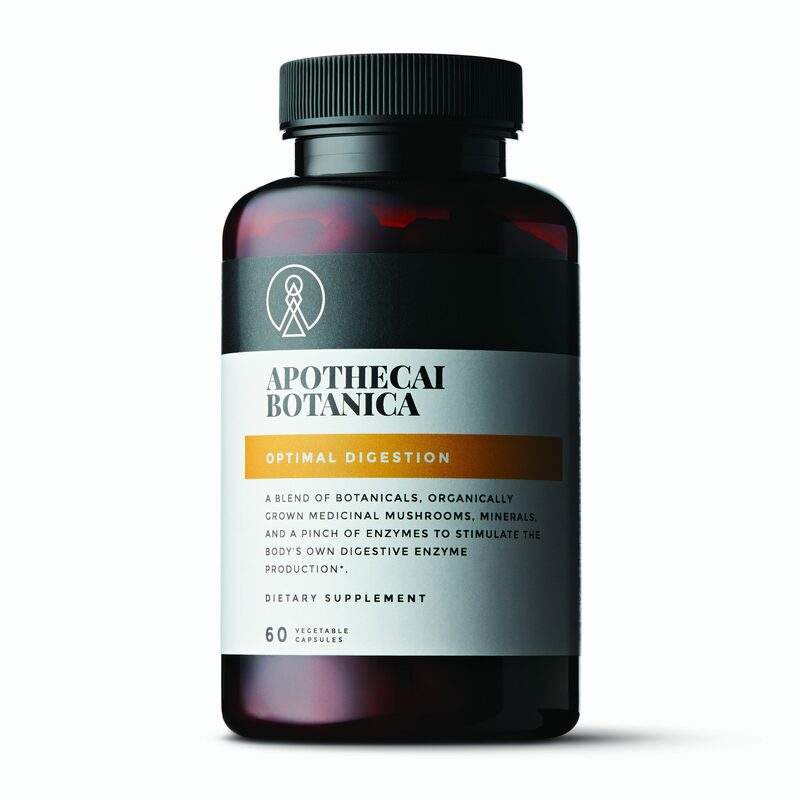 Optimal Digestion uses three targeted herbal, botanical, and enzymatic blends to support healthy digestion, reduce occasional discomfort, and keep things moving. A strong gastrointestinal system is vital for both women and men. For women, fluctuating hormones through the course of a menstrual cycle can cause changes in digestive function, often leading to bloating, discomfort, or irregularity. Men commonly experience imbalances in digestive health that can result in gastroesophageal reflux disease (GERD), acid reflux, and constipation. OPTIMAL DIGESTION works to address symptoms prevalent in both women and men while promoting regularity and supporting long-term digestive functions. This time-tested blend is gentle and non habit-forming. Enzymes are natural digestive aids that help break down food and allow nutrients to be absorbed by our cells. Often, the pancreas is unable to produce enough digestive enzymes, resulting in indigestion and other imbalances. Enzyme Boost Blend combines these naturally occurring enzymes to help the body digest better: Amylase, alpha-galactosidase, phytase, protease, invertase, and lipase. Traditional Chinese Medicine pays great attention to the gut. This time-honored blend of ginger root, sacred lotus seed extract, tangerine fruit, de-glycyrrhizinated licorice root, and henon bamboo herb has been used for thousands of years to effectively alleviate occasional nausea, cramping, heartburn, gas, and indigestion. This potent mineral blend gives your digestive system the support it needs to restore healthy balance and efficient functioning on its own. Suggested Use: As a dietary supplement, take 1 capsule twice daily before a meal, or as recommended by your healthcare practitioner.